What’s hot for gifting dads and grads this spring? Just ask global consumer products leader Jarden Consumer Solutions. The company, which counts noted household names like Crock-Pot®, FoodSaver®, Margaritaville®, Mr. Coffee®, Oster®, Holmes® and Patton® among its family of brands, is identifying top trends in gifting for the busy spring shopping season. Whether shopping for Father’s Day (June 21) or a recent graduate, consumers who shop the trends will undoubtedly be heroes as the season’s gifts are unwrapped. Gleaned from consumer feedback, three key trends will shape spring 2015 gifting, according to Mandy McCarthy, Vice President of Consumer Marketing, Jarden Consumer Solutions. Gearing up for a fun brand ramp that invites modern consumers to “experience the taste,” the Mr. Coffee® brand recognizes consumers’ desire for superior quality and taste, while needing to control expense. The brand just launched a personal brewer that delivers the taste and convenience coffee lovers crave, but at a fraction of the cost of owning a pod brewer. I absolutely LOVE my new Mr. Coffee® POUR-BREW-GO personal on-the-go coffeemaker (MSRP: $29.99) that delivers the taste and convenience coffee lovers crave, but at a fraction of the cost of owning a pod brewer. It allows consumers to brew their favorite coffee grounds directly into a colorful 16-ounce insulated travel mug for a quick, on-the-go solution without sacrificing quality or taste. No pod, grinder or other device is needed. Includes a removable, dishwasher safe personal filter basket. Available in a variety of bright and classic color s. Blue, Lime, Tangerine, Fuchsia and Black. I love how easy it is to brew for a single person (ME!) every morning and then it keeps it warm for me if I get busy with the kids! It is easy to wash and easy to drink from! Plus, it doesn't take up much room on my counter! From the Margaritaville® brand comes the hottest party starter on the planet, the new for 2015 Margaritaville® Bahamas™ Frozen Concoction Maker® (MSRP: $199.99) with a new “No Brainer” mixing tool. Promising restaurant quality frozen drinks without the recipe guesswork, this 400-watt “bartender” places exact measurements for the top three frozen drink recipes at consumers’ fingertips, and features a premium shatterproof 36-oz blending jar, and the option of manual or automatic “shave & blend” controls. At the touch of a button, the Margaritaville® Bahamas™ Frozen Concoction Maker® gets your party started. Its Shave-N-Blend™ control automatically makes a perfect, 36-ounce pitcher of margaritas or other frozen drinks in one easy step by mixing the right proportion of ice with your other ingredients. 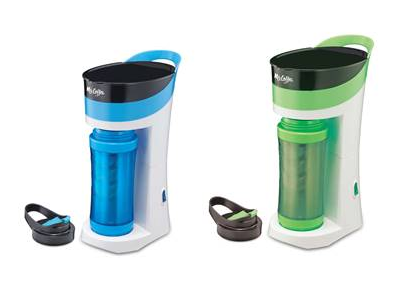 400-watts of power blends pitcher after pitcher of your favorite frozen concoctions. Includes the No-Brainer Mixer to help you create a fantastic batch of frozen drinks every time. Just pour in the ingredients into your mixer and twist - allowing your perfectly-portioned ingredients to pour right into the blending-jar. Themed parties are hot, and to satisfy the growing popularity of juice cocktail and “mocktail” parties, the Oster® JusSimple™ Juicer (MSRP: $99.99 - $129.99) provides the easiest path to extracting fresh-squeezed juice from whole fruits and vegetables. A Rinse ‘n Ready™ filter makes cleaning fast and hassle-free with a unique, easy-to-clean mesh coating that eliminates scrubbing to make every juicing experience amazingly easy. Power up to 1,000 watts, soft and hard settings and extra-wide chute conveniently juice a variety of fruits and vegetables without having to cut or chop. Easy does it with the Oster® JūsSimple™ Juicer that's easy to use and easy to clean. You can squeeze more nutrients, antioxidants and immune boosters into your glass and more time into your day. This juicer uses 900 watts of power and 2 speed settings to extract the most of soft and hard fruits and vegetables in no time. It's also designed with a wide chute so even large-sized fruits and vegetables can be easily juiced. You can customize your juice mixes with all the ingredients you want and enjoy. After you're done, clean up goes quickly too. The convenient Rinse ’n Ready™ filter has a special mesh coating that cuts cleaning time down with less scrubbing. Start juicing with the Oster® JūsSimple™ Juicer and discover how easy, and delicious, it can be to enjoy a healthier diet and lifestyle. Bring the coffeehouse home with this ultimate gift for gourmet espresso lovers. The Mr. Coffee® Café Barista (MSRP: $199.99) brews gourmet, specialty coffeehouse-style beverages in the comfort of home at a fraction of the cost of coffeehouse drinks using a 15-bar pump that delivers bold espresso and perfectly frothed milk to create cappuccinos, lattes and more at the touch of a button. Delicious espresso is automatically dispensed into the rich and creamy milk whipped up by the automatic frothing system. Pre-programmed settings measure just the right amount of ingredients and selectable brew sizes range from a 2-oz espresso shot to a full 8-oz cup. A special cleaning cycle makes clean-up hassle-free. Included recipe booklet features best-of-the-season beverages! After the party is over, preserving leftovers for future enjoyment is easy with the only 2-in-1 food preservation system on the market. The FoodSaver® 4800 Series Vacuum Sealer (MSRP: $169.99-$199.99) gives consumers the ability to preserve foods for both the long and short term with ease. This system works with FoodSaver® heat seal bags and rolls for long-term freezer storage, and, with its retractable handheld sealing accessory, consumers can use FoodSaver® FreshSaver® vacuum zipper bags, canisters and containers for short-term food preservation. In addition, a handy marinate mode infuses food with flavor in minutes instead of hours. Compact, upscale, and fully automatic, this counter-worthy appliance keeps food fresh up to five times longer than traditional methods, helps prevent freezer burn, and saves families up to $2,700 a year based on buying in bulk and on sale while also preventing waste. Dads, recent grads and college coeds who want to keep their new office and smaller living spaces fresh can use the Holmes® Permanent Filter “Egg” Air Purifier (MSRP: $79.99), which not only lends style to any room, but also keeps indoor air purified and revitalized. Featuring permanent filter technology with HEPA-type filtration that eliminates up to 99 percent of airborne allergens, this gadget features an optional ionizer, has three speed settings, and requires minimal maintenance. Recommended for rooms up to 112 square feet. 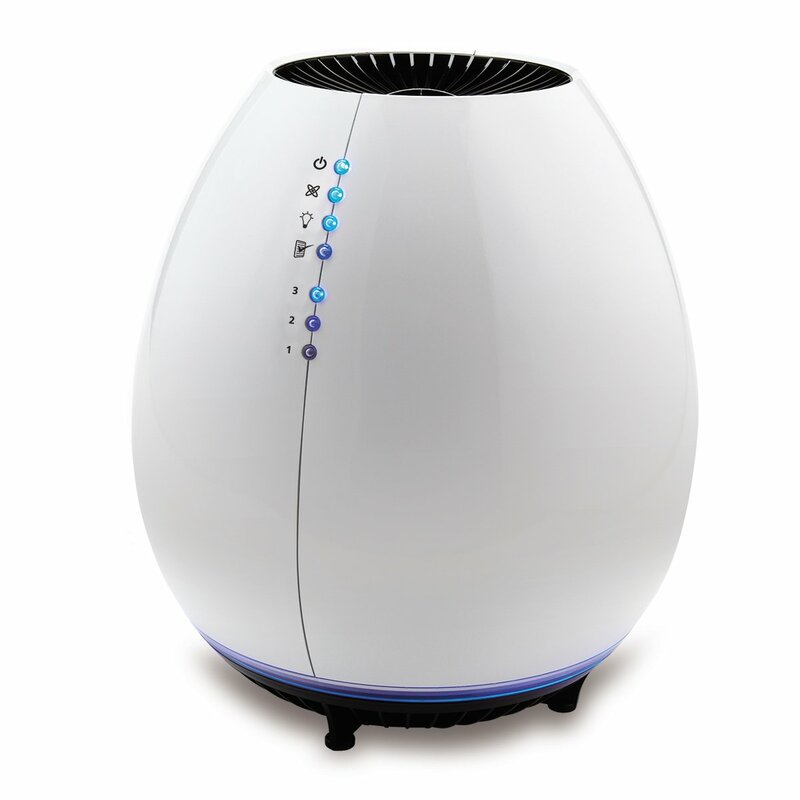 I LOVE the Holmes Egg Air Purifier and its permanent filter technology with 99% HEPA-type filtration that will keep the indoor air purified and revitalized. Trendy and functional, this air purifier will add a touch of style to any room! 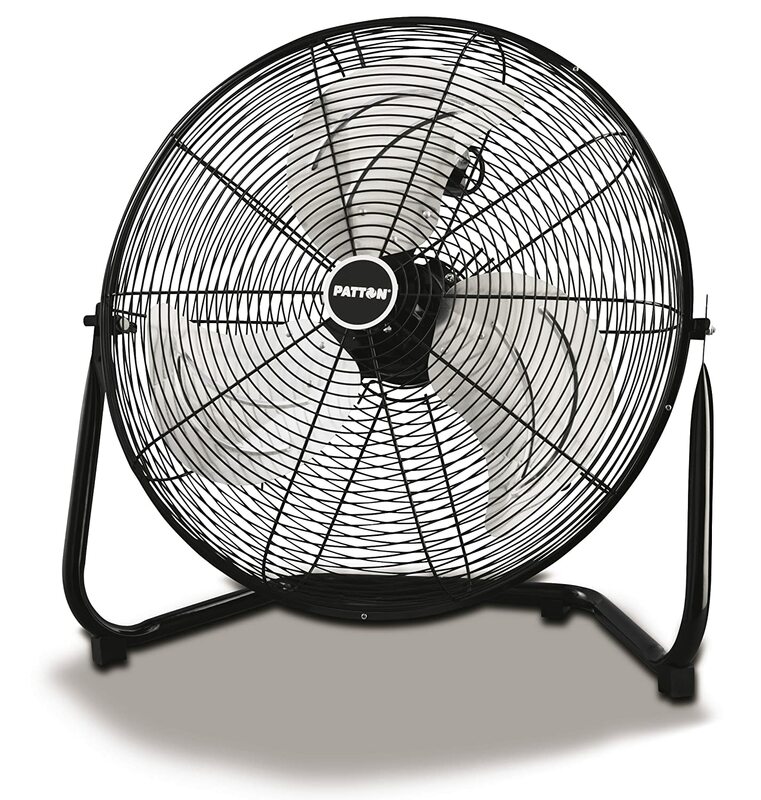 Finally, for the DIY weekend warrior who spends hours in the workshop and sprucing up around the house, the Patton® 20” High Velocity Fan (MSRP: $59.99) manages air flow efficiently, providing cooling, ventilation or drying. Durable metal construction ensures it will stand the test of time no matter the elements it endures along the way. A large 20-inch metal blade and three powerful speed settings promise maximum efficiency of air intake, air exhaust and air circulation, while the adjustable tilt head places it precisely where it’s needed. Any of these gift ideas would be great for Dad or grad or any summer entertaining you have planned this summer!